Lazy Gramophone have recently spent some time working with the wonderful Claire Wingfield. Claire runs a busy literary and editorial consultancy in Edinburgh, she has also published a book: 52 Dates for Writers - Ride a Tandem, Assume an Alias, and 50 Other Ways to Improve Your Novel Draft, which we highly recommend. This essential creative writing guide will take you away from your desk, to return with new ideas, fresh insight, better writing skills, and a renewed passion for your novel. It's suitable for both those who are seeking tried-and-tested strategies for revising a novel draft, and those who would like to improve their understanding of the writer's craft - to learn how to write a book that truly satisfies readers - and generate a store of ideas before starting to write a novel. Each of the 52 activities for writers to get out and do - from climbing a hill to visiting a favourite café, from sampling a new mode of transport to taking part in a hi-tech treasure hunt - is accompanied by an essay on an aspect of the writer's craft, and practical exercises to help with writing or revising your novel. Including examples from well-known novels, and a chapter on editing your work, '52 Dates for Writers' covers both the craft and business of writing - from how to write better dialogue and revamp your storyline, to how to write your synopsis like a pro and understand your market. Having used the book for some time now, I can say that 52 Dates for Writers is a great way to reflect on your work. 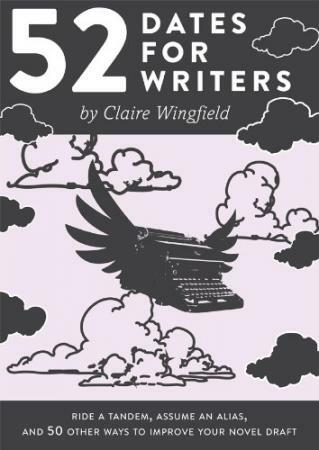 Claire Wingfield's ideas cast the writing process in a new light and the dates really do inspire. This is a guide that can be referred to time and again. I personally can't recommend the book highly enough. It is enlightening, informative and engaging, though most importantly is also accessible and a lot of fun. Whether you are looking to begin a piece of writing, develop an existing work or reflect on a completed manuscript, 52 Dates for Writers is undoubtedly one of the best tools you'll find. Tags for this post: Claire, Wingfield, 52 Dates, Literacy, Consultant. Un-related, spam, obscene or generally crap comments will be deleted. Please keep your comments related to this Journal. And lets all get on and be nice. HTML tags are not permitted and will be eaten if added! Comments between 5 and 240 characters only please (max 7 returns). Please note that comments will only appear after approval. Email is for gravitars. It will not be published, sold or violated! in any way.